We depend on water heaters to provide us the means to do a myriad of tasks within our home with more than just frigid water. This is beneficial for a number of reasons, not only beside it being much more comfortable day to day. 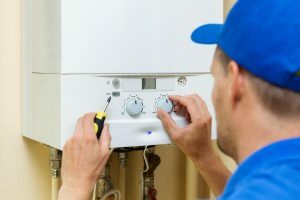 When looking for a quality water heater installation, maintenance or repair on your Edmonton property, you can always rely on the experienced professionals that SouthEast Edmonton Plumbers brings to the task. We are the cities premiere source of plumbing of all varieties. Closet water heaters are the most commonly installed on the market, and if you’ve ever taken a look at your water heater, you would see that it looks suspiciously like all others you’ve seen. This is both beneficial and a downfall at the same time, as it means that knowing how to install the item leads to the ability to install almost any of them. This also means that you can be unsure as to the efficiency of your water heater, as the differences between them are mostly in areas that those unfamiliar with them wouldn’t think to look. A relatively new option on the market lately, a tankless water heater brings you both benefit and drawback for your home and choosing this option can be for a variety of reasons. Tankless water heaters tend to take a little longer to warm up your water than standard options, and there can be many more of them installed in your home in order to give full coverage. This does mean that there is more of a chance for things to go wrong with one or more of them. When you need professional repair or installation of these items though, you can depend on SouthEast Edmonton Plumbers. We have extensive experience in all manner of water heater repairs and know what it takes to provide you with the results you’re looking for no matter the issue you face. From closet heaters to tankless models, we have the extensive knowledge of all types of units and know how to quickly diagnose and treat issues. No matter the problem you’ve been facing with your water heater, you can be sure that we bring you the capability to quickly turn back the hands of time, and to bring your water heater back to a state of reliability. If you feel that the time is up for your current water heater, or know that a replacement is soon to come, then looking into other, and more efficient options may be pertinent. Whether you want to swap out to a high-efficiency model of the same closet heater, or are looking to have a tankless model installed in place of the larger and bulkier model, you can be sure that we have the means to make it happen. A simple phone call to our offices will have the right experts on their way to bring you up to date.